T5Xi 1-5x24 is rated 4.7 out of 5 by 14. Rated 5 out of 5 by MaDeuceGunner from No better Mid Range Variable power Optic I absolutely love myT5Xi. Prior to owning this one, I had a Millett DMS-1 and a Trijicon TR-24G. I have shot, but not owned, the Vortex Razor 1-4x, and the T5Xi blows all three of them out of the water. The reticule is extremely fast; and TRUE 1X. To loosely quote a well known instructor: "Gun-fighting is a matter of millimeters and milliseconds. ", and that time you save because it is TRUE 1X and acts just like any collimated red-dot optic. I have made shots on a C-Zone MGM Steel target at 500m. The steel was well used and hard to see at that range with a 6X Leupold rangefinder, but thru the Steiner, it was very easy to make out. Optical clarity is, IMHO, unmatched, especially for the price. Don't waste your time and money, Buy once, cry once with Steiner. Rated 5 out of 5 by Christine95693 from What a View This is the first scope I have purchased at this price point and what a difference. It really is super clear and the lighted reticle is great. I am an older novice shooter and I can highly recommend this scope if you have issues with your eyes. Rated 5 out of 5 by Goliath from Outstanding Riflescope! A very high quality product. Extremely easy to use and adjust. There is a solid positive feel when making windage, elevation, parallax, or illumination adjustments. The objective and ocular lenses are crisp, clear, and unequaled. I tried out and researched several scopes before making this purchase and for me the T5Xi 1-5X24 rapid dot 5.56 was the best. The scope seemed optically and mechanically superior from the first time I worked with it, and complements my Daniel Defense M4V7SLW rifle very well. I would definitely buy this product again and would recommend it to anyone looking for a rapid dot 5.56 riflescope. Hope this helps. Rated 5 out of 5 by arcfide from Superbly Executed Modern Optic Background: This is the optic I went to after I finally gave up on finding a solid, lightweight optic for my Beretta ARX. So, keep in mind that I was "forced" into the variable power optics because I couldn't find what I wanted in any other configuration. I wanted to find an optic that would provide solid, optimized CQB performance while delivering the precision I wanted out to 500m. My emphasis is heavily on the CQB performance of any optic, and I view magnification as more of an identification aid rather than a marksmanship aid. I have astigmatism that prevents me from making really good use of red dot and holographic options, so having a proper optic with diopter adjustments became critical. I shoot accurately with iron sights, so a variable power scope, for me, is about expanding capabilities, not improving marksmanship. What I Like: * Great look and feel. Fits in very well with the ARX and has a sleek, low drag sort of profile, while still feeling very sturdy. * Illumination is every bit as good as competitors with great brightness and clarity. * Great bit of extra accessories with the caps and the throw lever included. * Nice of them to include two batteries. * Nice, simple, straightforward documentation that's relevant to the optic at hand, instead of being excessively generic. * My biggest surprise bonus was that the reticle isn't the straight crosshair reticle as depicted on the product page. It has the same hold overs and windage stadia, but it's a tapered crosshair which makes it *much* nicer than I thought for easy acquisition and keeping track of where you are, despite being so minimalist. I've really very pleased with the reticle now. Nothing complicated to get in the way, but everything I need to get the job done. * The 1× is as good as Steiner advertises. Very clear, great edge clarity, true 1× without funny business. The 1× is every bit as good as I hoped it would be, and it's very easy to get behind, so I'm happy there. 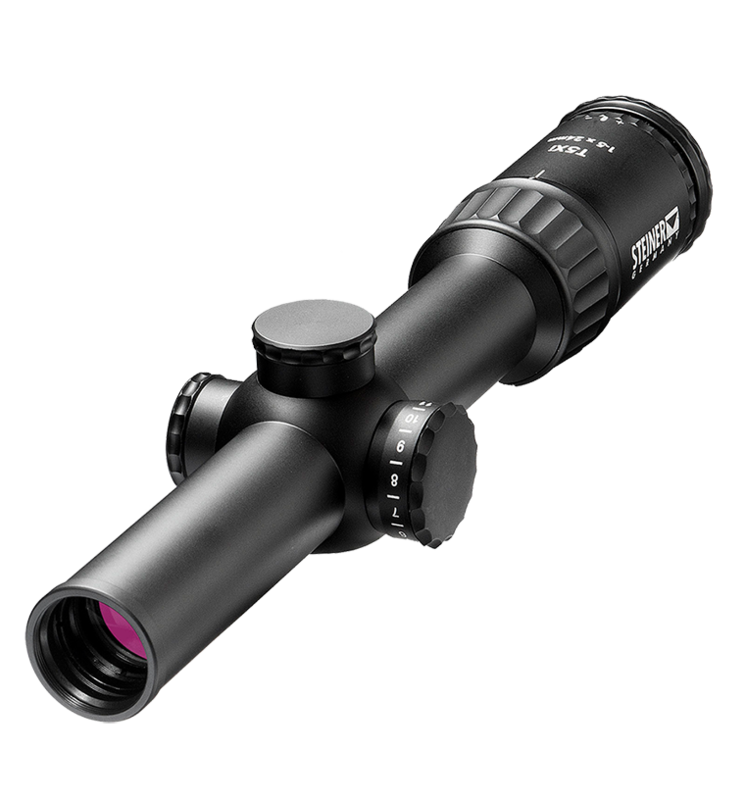 * The 5× is sharp and while I'm not terribly attached to magnification, it seems like a good power choice and certainly makes some observation and the like easier. * The turret adjustments feel good. * Auto shut-off on the illumination that you can turn on and off, which is quite nice. What I didn't like: * The optic is relatively long, so if you want to mount lots of things in front of the optic on limited rail space, this isn't your best choice. * The turret caps on this thing were devilishly tight, to the point that I had to use pliers and padding to rotate them off. Something must have frozen or stuck during shipping or the like, because they were very very tight. After working them on and off a little bit, they unstuck themselves and now they can be worked by hand, but that first time was truly troublesome. Overall: Steiner has a winner on their hands here. The optics are the real selling point of this, and you'd be hard pressed to find a better alternative optically at this price point. The weight and ergonomics are all good for a variable power, and the reticle is hands down one of the best reticles I have seen on a tactical CQB scope. If you want something functional, sleek, and minimal without loss of functionality, this is the way to go. It avoids useless feature creep and focuses on what I consider most valuable, the optical experience. It's definitely a bargain. This is an optic that gets out of your way and lets you get the job done. Rated 5 out of 5 by Bwbooner from Great Super Clear Optic!!! I looked at Vortex, Nightforce, Leupold, & Steiner. Steiner was hands down winner. Rated 5 out of 5 by Dizzle from Great Glass I bought this scope with the intent on putting it on a AAC 300 SBR but after seeing how clear the glass it I put it on my best AR a KAC and moved a Nightforce NXS 1-4 to the other, the 3TR reticle is my favorite. Thinking of buying another!! Could you please share the reticle subtensions for the 3TR reticle. The reticle on page 78 of the catalog doesn't provide he information I need. Namely, the MOA or MRAD of drop built into the reticle, for each of the subtensions below the main. There's a PDF with more details on all the reticles at: Support &gt; Download Catalogs. Will other reticles be offered? how do I know if my Steiner T5X1 is 7.62 or 5.56? I have three and see no markings on the outside, under the battery, or on the turrets. Hello, You can tell by looking through the scope at the top of the reticle. It will denote which version you have. What is the difference between the T5Xi and the M5Xi? What is the main difference between the military and tactical model of the 1-5x24? The Military is made in Germany and features our highest grade of glass we offer. What is the field of view at 100yds on 1 and 5 power? What is the eye relief of the 1-5?